The Cape Heritage Hotel not only offers guests a unique hospitality experience, but also delivers a level of service that is unsurpassed. Which is why this prestigious luxury boutique hotel is the Cape Town venue of choice for discerning travellers and business executives. The Cape Heritage offers a wealth of modern comforts, but retains its age-old charm and character. The hotel offers 17 bedrooms (standard, luxury and suites), each one individually appointed to enhance its unique historical character. The modern meets the master-crafted in rooms that feature high-beamed teak ceilings, 200-year-old Cape yellowwood floors and carefully preserved bespoke details. 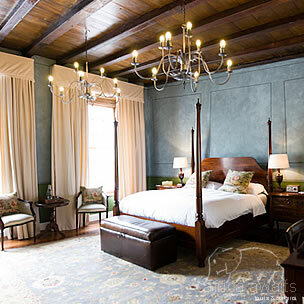 Throughout the hotel, sash windows reach up to high beamed teak ceilings and the original plasterwork preserved to showcase the original workmanship. Each room has its own unique character, stylishly appointed and featuring original artworks by established local names and exciting new discoveries. And of course the rooms are exceptionally comfortable and functional! All beds are extra length king-sized, with individually sprung mattresses and a selection of pillows. Every room is temperature controlled, and contains a mini bar, satellite TV, international power points and free wireless internet access. Our historic roots run deep into the 18th century. 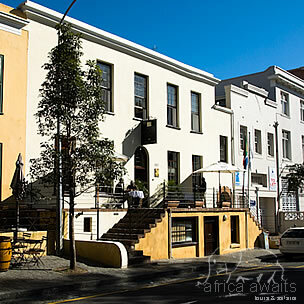 The Cape Heritage Hotel is an integral part of the restored Heritage Square, which is bordered by Buitengracht, Hout, Bree and Shortmarket streets. The earliest Dutch and Georgian houses were built in 1771; the Cape Heritage Hotel building itself was built in the 1780's. Like many houses of the day, it was centred around an intimate courtyard. A grapevine, planted in this courtyard in 1781, still flourishes today, bearing fruit and shading guests who shelter here for their daily repast. Thanks to vigorous pruning each year, the oldest known fruit-bearing grapevine in South Africa survives without ever being fed or watered! Archival research shows that most of the original buildings were used for commercial reasons; tobacconists, snuff makers, gunsmiths, bakers, coach makers and wheelwrights prospered here. There was a rope warehouse, several retail outfits, a boarding house, a chapel and an undertaker. Many historic features are still clearly visible in the hotel. Exposed original wall finishes and murals are complimented by dëcor that reflects Cape Town's diverse historical and cultural heritage. While the hotel dominates the square, this historic precinct also hosts a select handful of restaurants and shops, so you don't have to wander far to satisfy your needs. There is also a Gyrotonics and Pilates studio in Heritage Square, as well a private gym, run by excellent Personal Trainers. Enquire at reception to join a mat class or set up a one-on-one appointment. In the square you'll also find a boutique shop stocking a delightful array of South African fashion and decorative products, as well as Songololo Children, a funky toy shop which stocks exclusive brands from Europe and US, as well as quality local toys. With your holiday, safari or business trip from in to The Cape Heritage Hotel in Cape Town.